The number of California blue whales has rebounded to near historical levels, according to new research by the University of Washington, and while the number of blue whales struck by ships is likely above allowable U.S. limits, such strikes do not immediately threaten that recovery. This is the only population of blue whales known to have recovered from whaling – blue whales as a species having been hunted nearly to extinction. Blue whales – nearly 100 feet in length and weighing 190 tons as adults – are the largest animals on earth. And they are the heaviest ever, weighing more than twice as much as the largest known dinosaur, the Argentinosaurus. They are an icon of the conservation movement and many people want to minimize harm to them, according to Trevor Branch, UW assistant professor of aquatic and fishery sciences. “The recovery of California blue whales from whaling demonstrates the ability of blue whale populations to rebuild under careful management and conservation measures,” said Cole Monnahan, a UW doctoral student in quantitative ecology and resource management and lead author of a paper on the subject posted online Sept. 5 by the journal Marine Mammal Science. Branch and André Punt, a UW professor of aquatic and fisheries sciences, are co-authors. California blue whales ­ are at their most visible while at feeding grounds 20 to 30 miles off the California coast, but are actually found along the eastern side of the Pacific Ocean from the equator up into the Gulf of Alaska. Today they number about 2,200, according to monitoring by other research groups. That’s likely 97 percent of the historical level according to the model the co-authors used. That may seem to some a surprisingly low number of whales, Monnahan said, but not when considering how many California blue whales were caught. 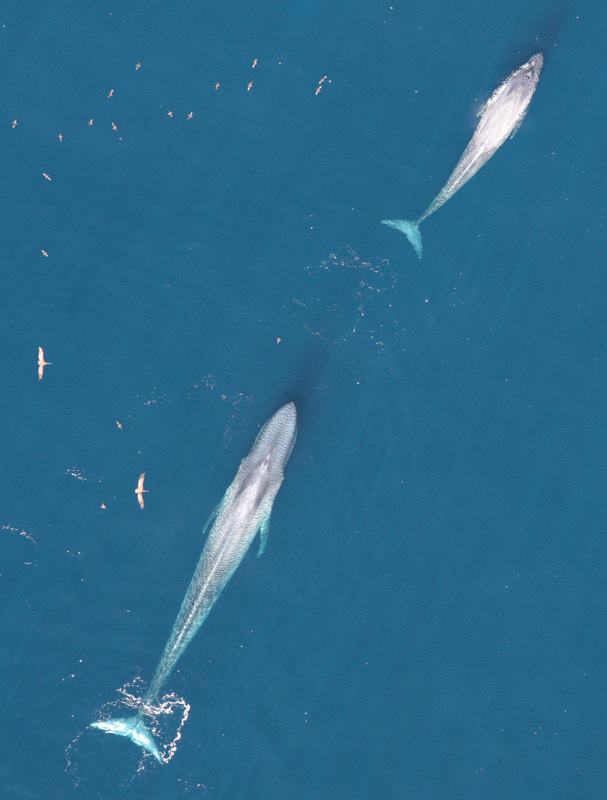 According to new data Monnahan, Branch and another set of co-authors published earlier this summer in PLOS ONE, approximately 3,400 California blue whales were caught between 1905 and 1971. “Considering the 3,400 caught in comparison to the 346,000 caught near Antarctica gives an idea how much smaller the population of California blue whales was likely to have been,” Branch said. The catches of blue whales from the North Pacific were unknown until scientists – in particular Yulia Ivashchenko of Southern Cross University in Australia – put on their detective caps and teased out numbers from Russian whaling archives that once were classified as secret but are now public. The numbers Russian whalers had publicly reported at one time were incomplete and inaccurate ­– something that was admitted in the late 1990s – but there wasn’t access to the real numbers until recently. For the work published in PLOS ONE, the scientists then used acoustic calls produced by the whales to separate – for the first time – the catches taken from the California population from those whales taken in the western Northern Pacific near Japan and Russia. The two populations are generally accepted by the scientific community as being different. Places where acoustic data indicated one group or the other is present were matched with whaling catches. 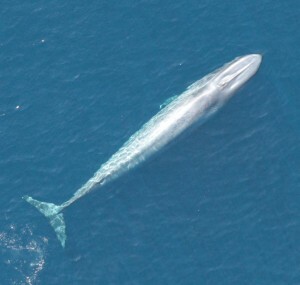 In the subsequent Marine Mammal Science paper just out, the catches were among the key pieces of information used to model the size of the California blue whale population over time – a model previously used by other groups to estimate populations of hundreds of fish and various other whale species. The population returning to near its historical level explains the slowdown in population growth, noted in recent years, better than the idea of ship strikes, the scientists said. There are likely at least 11 blue whales struck a year along the U.S. West Coast, other groups have determined, which is above the “potential biological removal” of 3.1 whales per year allowed by the U.S. Marine Mammal Protection Act. The new findings says there could be an 11-fold increase in vessels before there is a 50 percent chance that the population will drop below what is considered “depleted” by regulators. “Even accepting our results that the current level of ship strikes is not going to cause overall population declines, there is still going to be ongoing concern that we don’t want these whales killed by ships,” Branch said. Without ship strikes as a big factor holding the population back – and no other readily apparent human-caused reason (although noise, chemical pollution and interactions with fisheries may impact them) – it is even more likely that the population is growing more slowly because whale numbers are reaching the habitat limit, something called the carrying capacity. “We think the California population has reached the capacity of what the system can take as far as blue whales,” Branch said. “It’s a conservation success story,” Monnahan said. Funding for students working on the research in Branch’s lab comes through the Joint Institute for the Study of the Atmosphere and Ocean, a collaboration between the National Oceanic and Atmospheric Administration and UW.